Tipico casale in pietra con piscina privata circondato da un meraviglioso giardino ricco di piante succulente e ulivi e mandorli. La villa, costruita nel 1700 d.C., è indipendente, arredata con mobili antichi e situata in un tipico borgo rurale sulla collina di Scopello. La zona è fresca anche d'estate e la casa ha pareti di pietra perimetrale larghe un metro, quindi non ti senti mai caldo. La villa è molto vicina alla riserva naturale dello "Zingaro" dove si gode il contatto con la natura incontrandosi tra conigli selvatici, istrici, gufi, falchi, volpi, pecore e mucche. Sarai in grado di immergerti in uno dei luoghi più suggestivi della Sicilia: la "tonnara" di scopello con le sue meravigliose cataste e la sera assaggiare l'ottimo pesce locale e la carne con i migliori vini siciliani. Altrimenti visiterai i siti archeologici più importanti della Sicilia: segesta, selinunte, mothia o fai un giro a palermo, monreale, trapani, erice, marsala e le isole egadi (favignana, levanso e marettimo). Alla fine puoi rimanere a casa e goderti la più grande tranquillità, passeggiando tra mandorli e piante grasse o oscillando sotto un ulivo secolare. Note sugli alloggi: purtroppo non può ospitare animali domestici. Non è permesso fumare all'interno della casa. È possibile fumare in giardino. Non è possibile organizzare partito. Al di fuori: meraviglioso giardino pieno di piante succulente, ulivi e mandorli, parco giochi per bambini, solarium e molti angoli pittoreschi. Patio con tavolo e sedie. Barbecue. Forno a legna in giardino. servizio / asciugamani / biancheria / Colf di pulizia: La proprietà è pulita al momento dell'arrivo al costo di € 90. biancheria da bagno e lenzuola sono inclusi e cambiati ogni settimana. Il servizio di pulizia è disponibile su richiesta. The house is beautifully located, very clean, well-equipped, and the garden behind the house qualifies as a botanical one - it is gorgeous! The landlord, Fabio, is very friendly and helpful. The house is a great starting point for visits to the archeological sites of Selinunt, Seleste, Mozia and Solunto, and for great walks or hikes in the National Park of Lo Zingaro. We will definitely come again! We stayed one week in this fantastic place and we highly recommend it. Our first impressions on arrival was that Fabio and his family were warm, friendly and very welcoming. In addition, we were not disappointed as the house was much nicer than the pictures on the website. This was even more obvious in the morning as we were enchanted with beautiful views, lovely gardens and a well-kept refreshing swimming pool. It was also ideally located because it was a short drive to the supermarket, the historic town of Scopello with all its amenities (restaurants, cafe, gelateria etc) and several beaches. Normally I would not think about visiting the same place twice but it was just what a family like us with small children needed :)... a home away from home. 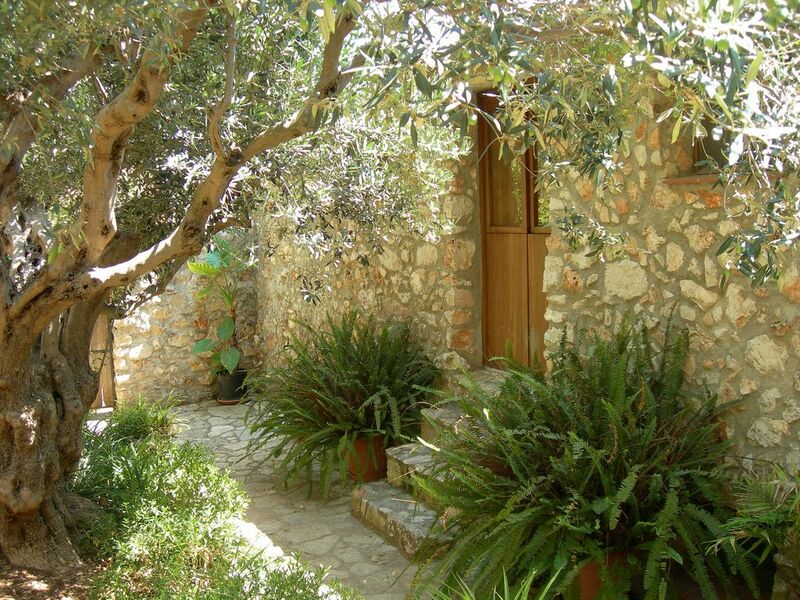 High-up on the hillside beside an ancient, peaceful village - we found Rosalba's beautiful, traditional cottage. Nestled amongst the most fantastic, serene garden full of native flora and fauna - much to our 7yr olds delight! With plenty of seating areas from which to contemplate and admire the view and not forgetting the lovely outdoor dining/BBQ area & heated outdoor shower, an exotic luxury. From the rooftop terrace and pool we were surrounded by amazing views across the valleys and coastline and a pleasant breeze cooled the air and accommodation and filled it with the scent of jasmine, thyme and eucalyptus. Inside the cottage was a dream, immaculate, tastefully furnished with an attention to detail and complete with everything you could need to make your stay comfortable. There was ample room to relax in and make yourselves feel at home, lovely thick stone walls and amazing shutters provided a pleasant ambient temperature and guaranteed a good nights sleep! Our hosts were amazing. Charming, helpful and most accommodating. They were there for you when you needed them and most discrete, when you didn't. A welcome hamper (including fuel for the BBQ!) was all greatly appreciated. The location of this cottage is fantastic, plenty of places to explore including gorgeous unspoilt beaches, fresh local produce in abundance-(great couple of shops just down the hill) and nice places to eat. Scopello old town was charming. If you're willing to drive, this cottage is perfect for a quiet, relaxing family holiday. We are counting the days until we can return already! This was our second HomeAway although we have used a similar company before for many years. Rosalba and her family we so kind and sincere. We have new friends now in Sicily and plan on coming back. We had ten days here and the location was perfect! It was close to the beach and the grocery store and not far from great places like Segesta and Erice. We have two children ages 7 and 8 and they enjoyed the pool, the gardens, the solarium, and the play area. We grilled every night and shared a dinner with our amazing new friends. I would highly recommend this authentic, organic, amazing home to anyone. Be sure to ask them where their favorite beach is and the history of the ancient caves just steps from their home!! Wir haben genau das gefunden wonach wir gesucht haben. Wunderschönes Haus, traumhafter Garten und zauberhafte Gastgeber, die an alles gedacht haben, damit man sich wohlfühlt. Rosalba und Fabio waren sehr gastfreundlich und haben gute Tipps! Verschiedene schöne Situtionen um draußen zu relaxen oder am großen Tisch unter der Pergola zu essen. 8 perfekte Tage haben wir zu viert im Juli hier verbracht. Mit dem Auto erreicht man tolle Strände und die umliegenden Sehenswürdigkeiten und Orte. Unbedingt bald wieder! 5 minuti di auto dalla spiaggia "Guidaloca"; 7 km "Zingaro" riserva naturale e "Cala Mazzo di Sciacca" spiaggia. Ristorante 2 km; Market 5 km; Mini Golf 3 km; Diving 5 km; Equitazione 1,5 km; Castellammare del Golfo 12 km; Trapani 30 km; Palermo 65 km. spettacoli estivi tenuti al teatro greco di Segesta; durante il periodo pasquale, è possibile guardare a Trapani la famosa processione dei "Misteri". The property is cleaned on arrival at the cost of €90. Bath towels and bed linen are included and changed weekly. A refundable damage deposit of €300 is due.